Well, its been a pretty busy Lord Of The Rings Day for yours truly. I took the Lynx ferry from Picton to Wellington and hooked up with my good buddy Big Geoff before heading to the Te Papa museum. As far as museums go Te Papa is on the cutting edge and a Lord Of The Rings exhibition makes a must see attraction. No cameras allowed in ( no surprise there) but no reason to not get a quick piccy in the foyer to remind me in years to come that I was actually there. And no, the Argonath is not to scale - I am not as tall as Morgoth, not even on tip toes! The exhibition is on the 4th floor and covers about the area of a large basketball court. Items of interest are arranged in cocentric circles moving out from the middle of the room - in the center is a dimly lit room with the One Ring suspended in a column which runs from floor to ceiling. The walls feature a band of fire around at about chest height which casts an ornage glow across the display. Fiery runes move across the floor ins spinning fashion and an eeie glow lights the column. A very cool effect and one that truly reflects the majesty of the golden band contained within. Circling the outside walls of this chamber are displays featuring Sauron in his 2nd age suit of armour and weilding his mace (set against a frieze of Baradur), a statue of the Cave Troll (not life size but rather large), including a Moria Orc and various backgrounds and props from the Chamber Of Marzubal sequence. There is also a wall featuring pictures of Gollum and also a screen showing various video clips about bringing him to life on the screen. These videos are a common theme throughout the exhibit and generally feature one or more short documentaries concerning different aspects of the film making. There are a large number of armour and costume displays and those of the main characters have pictures and pertinent information featured with them. There is a wall which provides examples of the various swords used by the Elves in the Last Alliance and the horsemen of Rohan. There are 3 examples of each and you are invited to examine/touch each sword and guess if it was used in the choreographed fight scenes, for purely ornamental use, or by extras in the background where the look of the sword was the only important consideration. A large green screen is accompanied by two different mockups of Gandalfs' cart and multiple video cameras - this allows two people to be shot using the forced perspective method used in the films - very cool. But don't wear a green shirt or, like one chap, your shirt will be completely see-through and you will appear on camera as a disembodied head and two arms! The minatures on display of Isengard and the Bywater Mill (fom Frodo's vision in Lothlorien) are seriously impressive and you can sense the countless hours and blood sweat and tears that went into creating these pieces. The main feeling you take away from all of the displays is that someone has put an incredible amount of work into creating the world of Middle Earth for the big screen and we are so very lucky that these committed souls have succeeded in capturing Peter's vision perfectly. The exhibition is a very good reason to part with $12NZ and I urge anyone in the Wellington area to see it before it departs for the rest of the world. Outside Te Papa it is still a bright and blustery day in the capital. One thing you notice immediately is that nearly every second lamp post or power pole in the central city has a Lord Of The Rings banner adorning it - this town loves the movies and their creator and is not afraid to show the world! It is a short walk to The Embassy theatre and as we round a street corner ahead of us we see Gollum peering over it's roof trying to get his hand to the One Ring which spins lazily over the theatre entrance. Five hours later and it is back to The Embassy to see The Two Towers (my second viewing). Whilst the foyer of the theatre has been restored, th actual cinema itself can be best described as "run down". The only improvement here is the sound system and after managing to resist the temptation of buying copius bottles of Shadowfax Chardonnay Big geoff and I take our seats and prepare to be aurally and visually assaulted - in a good way. Alas it is not to be for a good while as after a few trailershave run the house lights come up and a lengthy pause suggests there is a bit of a technical hitch in progress. It is confirmed by staff a short time later and it is noot until an hour has passed that the film rolls and the Wingnut Films logo is greated with great applause. And how loud was it! The volume was just short of deafening and coupled with teh fact the Embassy screen is rather large meant that the vfilm was definitly worth waiting for. Glaurung here, its only 5 sleeps until I fly out of Christchurch (NZ) and head for London and the FOTR premiere. Not that I have a ticket to get in! Be sure I will be there rain or shine to report on the goings on - you might even get a few pictures if you're lucky. We found the bar easy enough as it was rather overrun with patrons. We joined the throng and waited patiently for our turn to be served � no money seemed to be changing hands which was an added bonus. There�s nothing like free jack (and no I don�t mean that crappy Emilio Estevez movie) after all! Whilst we waited in line, I had time to scan the room and see if this was indeed the movie party. I didn�t have to look around for long � the ranger Aragorn was playing pool off to the left of the bar and there seemed to be a lot of hobbit-sized folk milling around him. Then a group of people moved past behind me and as I watched them go, I noticed Mithrandir strode among them � I tapped my colleague on the shoulder and he was just in time to see the grey company make their exit. We were indeed in the right place! Another drink in tow and I decided to grab a seat in the main room before I fell over. It wasn�t long before I was engaged in conversation with one of the production�s legal chaps. He told me when he had finished law school he petitioned the production to offer his services � he must have said all the right things because they snapped him up! He had been organising things legal when it came to using land for filming, and he also told me how many rental cars had been written off so far. Which I can�t quite remember but I�m sure it was at least 3. We eventually started talking about me and the horses, and how I must know Steve, and I knew then it was time to make a quick exit. Mumbling something under my breath I headed out the main doors to Sauron in the hope that Doctor Woolhouse would be there. There was no sign of life out front. I decided it would be a good time for another sit-down (and a drink) and planted myself on the grass verge above the roadside kerb. I was soon joined by a man from New Line Cinema who spoke in a very thick American accent and was smoking the biggest cigar I had ever seen. We ended up talking about budgets and he told me that while New Zealand was a cheaper place to make a movie, a production of this size in a new territory still seemed to swallow up vast chunks of capital. I was only really convinced of this when a taxi from Ashburton (a town about 50-odd kilometres away to the South East) arrived to pick him up and take him back there. A few less long-distance cab rides and the budget could well have been smaller! Finding myself able to walk upright again I ventured inside once more. I searched high and low for the Doctor only to find him hanging clothes to dry on Sauron when I returned. The bar had shut and the party was winding down. We had been guests of the production for around 5 hours by my estimations. I told my companion he should have been using this time to hob-knob with the rich and famous instead of practicing his dog-paddle; he simply chuckled and told me he had done quite well for himself. Oh yes I said, and just what has the watcher in the water been up to? After a long and involved soliloquy he managed to convey to me that the King had spoke with him a while, and also admired Sauron�s nametag. Not only that but he had secured his autograph and also one for me. He said if I didn�t believe him I should head back to the hotel and check � which I immediately did. We fair hopped, skipped and jumped back to our hotel. Sure enough, Aragorn had signed my copy of The Return Of the King! It was a great ending to a great (but strange) day and before we retired to our beds there was but one more thing to do. Retrieve the car - we had left Sauron behind! After what seemed an eternity of drinking the local drop (Jack Daniels � he lives everywhere apparently), and after our successful incursion of Edoras earlier that day, we were starting to feel very relaxed and not at all pished. The bartender inquired about our day skiing and after our non-coherent reply he guessed we were not skiers at all�Damn he was onto us�After we were interrogated about our true motives (interrogation consisted of more Jack), we let on that we were LOTR fans and had been to the Edoras movie set. A tap on my shoulder from my companion made me turn around and look.. There was Gandalf (minus the beard, cape, hat and big long stick thingy) with a group right beside us having a good old laugh at something! We were dumbstruck with awe. Obviously this called for some reinforcements and luckily Jack was at the bar (I told you he lives everywhere), and Jack is so much better when he costs nothing! We did a quick scout of the bar, lounge and poolside and found a quiet corner where we could sit and piss ourselves laughing at our good fortune. I then noticed a man playing pool who looked familiar, and then promptly fell off my seat as I realised it was Strider. He was a lot shorter than me (I�m 6�2) and was in bare feet and rugged clothes (in character always apparently), but he was instantly recognizable. It didn�t take long before we had some company, not an elven princess as I would of liked, but a likeable rogue who looked very familiar (Lionel from Shortland Street in fact). After asking us if we were glad to have a break after 12 consecutive days filming (we were like �Of course, it�s so demanding�), he then led us into a discussion about the part he was playing in the film (Hama the Door Steward of Meduseld). After a discussion containing much inside information (which we won�t divulge!) we got to the question which we were desperately trying to avoid - he asked us what we did on the set!!! Whilst my companion (sensibly) managed to quickly come up with something to the effect of looking after the horses, I struggled to find an answer. I consulted Jack knowing he would provide me with a suitable reply. �A Doctor� I proclaimed. The rest of the adventure that evening (morning) was sort of a blur, and no, this is no Shortcut To Mushrooms�. I also remember trying to convince some fine Elvish ladies to have a swim but alas, they think 5 degrees (Celsius) is cold!! The trip to Methven was not a long one. We sped across the rich fertile Canterbury Plains and arrived at our destination to find the townspeople slumbering in their beds. 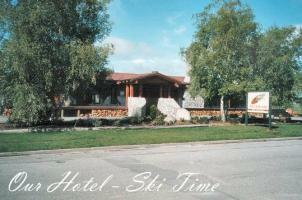 First port of call was to book in at what would be our lodgings for the coming evening. As we carried our luggage in the proprietor asked us if we were "skiers or boarders?". Mumbling something unintelligible under our breath we shuffled off to our rooms. Immediate exploration was out of the question (we soon discovered) as the lack of a good nights sleep, plus the rigours of our early morning adventure had drained us quite considerably. A nap was called for before we embarked on our next voyage of discovery. 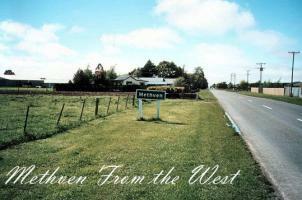 Around noon we awakened and slipped into the bustling metropolis that is Methven. We immediately happened upon the town hall which was being used as the film unit's base of operations, but all was quiet - obviously the Edoras filming was in full swing. The rest of the town was completely devoid of any obvious movie connections so after a while we returned to our hotel for a spot of lunch. It was during lunch that I realised I was totally unprepared if we actually ran into any celebrities! Sure, we had a camera but had I remembered to bring a copy of the book (or anything) to be signed? No! Back to town we sped, my offsider had his trusty dog-eared copy of LOTR but I had to settle for buying anew copy of The Return Of The King. For obvious reasons the Methven bookstore was sold out of all other versions! 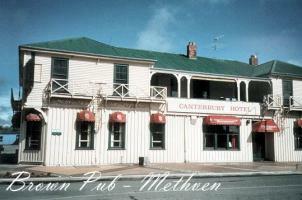 It was now 2:30PM so we adjourned to one of the local watering holes to watch Canterbury play Waikato at Rugby Union (Edoras vs. The Shire). Up for grabs was the coveted Ranfurly Shield, the prize of all prizes as far as New Zealand Rugby is concerned. The town came to a standstill and there was much yelling and consuming of beer for 2 hours. Much to my annoyance Canterbury lifted the shield from Waikato and much celebration ensued. 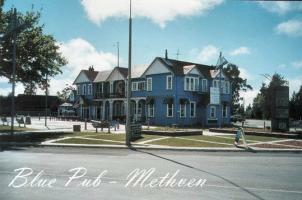 NB There are two main public drinking establishments (pubs) in Methven. Their names are Blue Pub and Brown Pub. And yes, because one is painted blue and the other is painted brown! Ah, the quaint hamlets of Canterbury and their imaginative population... good thing they can play rugby! The day had taken it's toll on us (with the help of not a small number of mugs of ale) and so again we returned to our hotel for a nap. We were not used to getting up at the crack of dawn (doom) obviously! We rose for a late dinner and then proceeded into town in search of the wild celebrity nightlife we had been primed for. We were sorely disappointed. 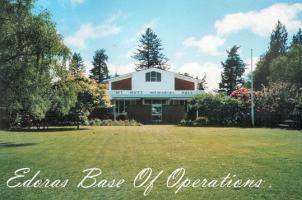 After traipsing around the places to be seen (at night in Methven) we came up very short. Not one sighting of anything even vaguely resembling the huge production that is The Fellowship Of The Ring. We were dejected and gloomy but all was not lost - we had not stumbled into the midst of the production but we had had a lot of time to sample more of the local brew. By the time we returned to our hotel it was nearly the witching hour and we were (to put not to finer point on it) rather cut! Ringer Super Spy Glaurung sends along these AMAZING pics from the long destroyed Edoras set! These pics are truly amazing, you can see the attention to detail and the truly REAL feeling this set has! Take a look!